This weeks theme is a free choice, so I'm highlighting my two ancestors that are linked through their daughters to me. They also had similar jobs, both were involved with border and community protection in one way or another. Firstly I'd like to introduce Doede Thomas Lawerman, born in Driesum, Friesland, in 1857, whose daughter Berendina Lawerman married my grandfather Cornelis Blomberg. Their first-born son, my father, was named in the proper tradition after both his grandfathers Jan (Blomberg) Doede (Lawerman). Anglicised he would have been called John David. On my mother's side is Christoph Wilhelm Emil Reith, the father of Meta, who married Jan Reinier Charles Peelen, and their first daughter Annemarie was my mother. Christoph Reith was born 8 November 1856 in Eschwege, Hesse Germany and he married Marie Susanne Friedericke Luise Schuman probably around 1883. Marie Susanne was born in Herborn, Hesse, Germany on 15 April 1859. This week it is the optional theme of frightening. I have already posted about my grandmother Meta who was taken to a Japanese prison camp in Java in March 1944. She wrote in her diary how worried she was that she would not see her daughters again. To her immense relief they were united at the Police station where all the detainees were rounded up before being transported to their prison camp. She describes how they arrived in the driving rain. For the first few nights Meta could hardly sleep but in the end exhaustion won out and she finally had a good night's sleep. Meta's experience in the camp is detailed in my blog Meta Writes. It must have been so frightening to suddenly be taken away to an unknown destination for who knows how long. But Meta adapted once she got over the shock and it is interesting to see in her diary how the imprisoned women somehow created a community with its own routines. Week 43 - Oops, don't look now. My grandmother Meta Peelen peeked over the garden hedge one late afternoon wanting to see what the commotion she heard on the street was all about. She saw the Japanese soldiers rounding up the neighbours and loading them on trucks and Oops, she was seen and told to get on the truck herself, without any further ado. This happened on 15 March 1944 in Bandoengan, Java, Indonesia. The Japanese forces had invaded and occupied this Dutch colony in March 1942 and from that moment on life would never be the same for the Dutch civilians and even the local people. Very soon after the Japanese forces surrendered on 15 August 1945, Indonesia under the leadership of Sukarno declared independence but it would take a further 3 years before the Dutch Government recognised the new state. Well this is a loaded word - an ancestor to be proud off? Yes I do have some ancestors with interesting stories and lives that make you proud to be related. It is easy to become engrossed in their stories that read like an epic novel. But at the end of the day their stories are not my achievement. They lived their lives as best as they could and that I happen to be descended from them is just a stroke of good luck. Then there are family pieces that take pride of place. The little Chinese lacquer cabinet, the dainty bronze dancing figure, inherited from my aunt who was a dancer herself, the photographs, the tender pencil sketch my grandmother Meta made of her 6 year old son which now hangs on my wall next to her silhouette cutting of my mother's profile as a young 21 year old. Probably the strangest piece I have is the small memorial broche which features a tombstone with initials all made from strands of hair from another great grandmother. Right now I am intrigued and interested in the life of my great-great grandfather on my mother's side Reinier Scherius. He was born 12 June 1810 in Amsterdam and was sent off to sea for health reasons. He was prone to infections and in those days it was thought that sea air was the cure. He ended up in Java, Indonesia and made a career in government. He was appointed to the post of Resident of Probolingo but before that had various postings around Indonesia, starting with Palembang, then Menado and also Gorontalo, all of these were quite remote. He was evidently a well respected administrator and in his posting to Menado as Resident he had a young Edward Douwes Dekker working for him as secretary who became a famous Dutch writer with the name of Multatuli. His most important novel Max Havelaar, is a protest against the Dutch exploitation of the local indigenous Indonesian population. Apparently Reinier shared some of his views. 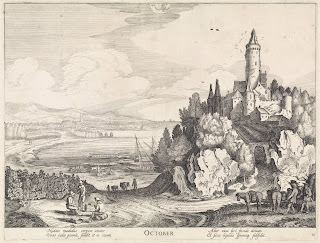 October was not a good month for birthdays amongst my ancestors. Hunting through the family tree, only one comes up in the direct family line. This is my great grandfather six generations back. He was born October 19 1746 in Hoogeveen Drenthe, The Netherlands. His name was Jansen (Hendriks) Bloemberg. Bloemberg means flower hill literally. By the time his great-grandson Johannes is born in 1828 the surname has changed to Blomberg. Don't know why, or when, perhaps it happened when the Dutch were under French rule and Napoleon decreed in 1811 that everyone should have a surname. He came from a large family, at first count it looks like 7 siblings and he had a large family himself. I have no details of his occupation or work. He lived his life in Hoogeveen, a small town in Drenthe, which dates its history back to 1625 when Roelof van Echten bought the land to harvest the peat, which was its main industry. So it is fair to assume that he would have been a peat worker. My mother married a glove - in Dutch: met de handschoen getrouwd. This rather intriguing phrase conjures up an image of a bride saying I do to a giant glove! But it was not just a glove, there was a straw groom - stro bruidegom - a stand-in for the groom. 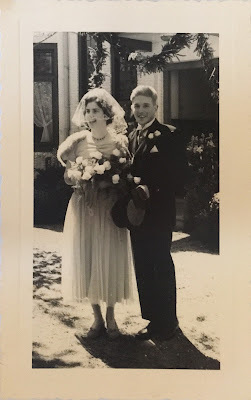 My post for week 39, 52 ancestors challenge, concerns this unusual custom that once was standard practice to unite in marriage those separated by a great distance. As far as I know and as it was told to me by my mother this practice arose in the days of the Dutch East India Company, the VOC. Apparently the VOC ran orphanages in Amsterdam and the girls were married off to VOC officers in the colonies. They didn't know each other, these were arranged marriages. So a pair of gloves was how they matched up the couple, one was kept with the girl and the other sent to the groom. Once the girls arrived in the Dutch colonies in the East or West Indies, the gloves were matched up and the marriage confirmed. This post is inspired by 52 ancestors challenge theme for week 38. A favourite place - as I mused about it many different places came to mind, so I'm writing about favourite places, in the plural. There are holiday places like Cameron Highlands, Frasers Hill and Penang Hill in Malaysia. These highland places were favourite holiday destinations because they offered cool respite from the tropical heat so oppressive in the days before air conditioning became common. My father took my mother, his bride to Darjeeling for their honeymoon after they were married in Calcutta. It must have been a welcome relief for her, after a two day journey flying from Amsterdam, overnighting in Rome, then to Karachi, another overnight stop and then arriving the next morning in hot and dusty Calcutta. Continuing on with 52 Ancestor Challenge to week 36 Working for a Living, I'll go on with the story of Jan Blomberg and his wife Johanna Cornelia Bronke. They were teachers. They had two sons, Johannes born in 1881 and Cornelis born in 1891 and a girl, Cornelia, who sadly died young at the age of 6. Jan paid for his eldest to go to University but made him promise that he would in turn pay for the University study of his brother, which he did. Both sons gained a PhD in chemistry and became pharmacists or Apotheker in Dutch. Johannes was the more entrepreneurial of the two. As soon as he finished his studies in 1903 he took over the apothecary of Dr J Attema and developed it into an independent company manufacturing medicines such as insuline and anaesthetic drugs. He travelled widely to extend his knowledge and imported Indonesian herbal medicines. This post is inspired by the theme of schooldays, the post theme for week 35, 52 Ancestors Challenge. I'm reflecting on two grandparents who were school teachers. Jan Blomberg was born in Zwartsluis on 12 June1856 and his wife Johanna Cornelia Bronke was born 14 December 1851 in Zaandijk. They married on 23 May 1881 in Zaandijk. Johanna was already 30! And Jan was 25. Jan became "Hoofd ener school" - Head or principal of a school. I haven't got any facts as to where but I assume it would be in Amsterdam. because in 1882 his eldest son was born there. These bare facts enclose so much more if you let your imagination wander. Did Jan have a stellar career? Or was it a standard career path. How did he decide to become a teacher. He was the son of a trader and river barge captain, why didn't he follow in his fathers footsteps? Was he the smart one in the family? 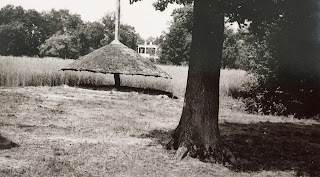 This post is a response to the 52 ancestor challenge I've joined at nostorytoosmall.com. The nominated theme for the week got me thinking about a chance discovery that actually told me quite a lot about my ancestor. Googling away on his name one night I found a record of his military conscription at militieregisters.bit.pub. 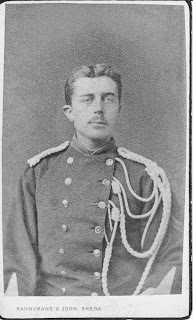 We're going back now to 1879 when Jan Hendrik Peelen in the Netherlands appeared before a Military Tribunal at age 20. It is taken from a military register held at Noord Hollands Archief. The register lists name, birthdate, birthplace, residence, parents, occupation, height and physical description and finally whether the person was accepted into service or exempted, with the reason. My great grandfather was exempted because he was the only son and heir in the family. He had two sisters but they died at an early age. This exemption was granted on 12 March 1879. Reijnier Scherius' links to the Spice Trade and VOC. Reijnier Scherius, the father of Reinier Scherius, was at least for a few years in the spice trade. That it is how it seems from the record cited in Open Archives. The first record dated June 27 1776 has him joining as a soldier of The Dutch East Indies Company (VOC) and setting sail on the ship Beemster Welvaren for Batavia. They arrived at the Cape on November 28 and stayed until 31 December 1776 and finally they reached Batavia on 10 April 1777. He did not return to the Netherlands straight away and this ship perished in 1778 near Indramajoe. It seems he stayed in Batavia until he got on the ship Hof ter Linden 6 February 1779 and arrived back in Amsterdam on Monday 27 September 1779. He did a couple more voyages to Batavia and then resigned for the last time in August 1784. During this period at sea he moved up the ranks from weapons mate to third helms mate. Not the Reinier Scherius I was thinking of. Upon checking the resource Scherius Family it is now clear that I've got the wrong one. This is the father of Reinier Scherius. Still family of course. It gets confusing when generations carried the same name. Today I searched for him in several ways and came across some interesting stuff. This page shows that he was employed by the VOC as firstly a weapons masters mate on the ship Ceres. Several other records show that he made his way up the ladder with each voyage to Indonesia, on different ships. It was usual to just rig out a vessel for the specific purpose of spice trade and man it and come the end of the voyage everyone was laid off and possibly got a share of the profits? Another interesting site about VOC is VOC site which lists the ships. I also found some mention of the name Scherius on Familie Archivaris and have signed up for free membership.